Win a $50 Gift Certificate to 10Pin! Congratulations to Bryonna Nichols on winning our fifty fifth High Five Giveaway and thank you to all who entered! 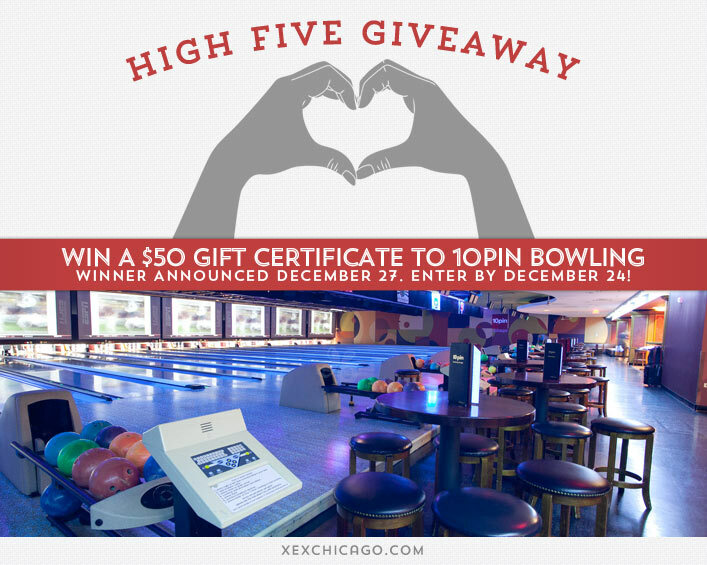 Our next High Five Giveaway is for a $50 gift certificate to 10Pin Bowling Lounge. 10pin is a favorite destination for young and old, singles and families. If you’re looking for a good time, you’re in the right place! 10pin redefines the bowling experience by combining a retro sport with a hip upscale lounge. located adjacent to the house of blues in landmark marina city, 10pin is 20,000 square feet of high energy fun. twenty four state-of-the-art lanes are topped by 8 high-definition video screens supported by a nightclub quality audio system. Guests can enjoy all the action from the plush sofas and intimate seating areas of the lounge or can be served at laneside tables. this cutting edge bowling lounge offers an extensive martini list alongside a collection of small plates featuring innovative american cuisine designed to encourage sharing. Visit their website at www.10pinchicago.com or call them at 312.644.0300 for more information. Name one food that helps your hair stay strong and healthy? Now, just add a comment to this post with the right answer to be eligible to win! The winner will be announced on Friday, December 27. Entries must be received by midnight on Tuesday, December 24. Good luck!